Lime-Lychee-Lavender Chocolates - Do You Know The Muffin Man? Notes: With all the leftover milk chocolate, I decided to make another batch from the book. 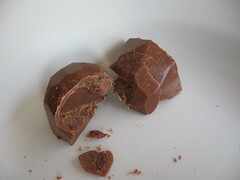 I was in a rush and as a result, the tempering and molding were quite sloppy. I let the excess chocolate drip over a rack, but didn't scrape it clean. As a result, when I sealed the filled chocolates, I wasn't able to level the bottoms so the whole mold was covered in lumpy chocolate. They came out of the mold alright, but required some trimming. The ganache I made replaced the pastis in the original with Soho liqueur and four drops of lavender oil. I also forgot to strain the mixture so there is lime zest in the filling. Quite an interesting flavour combination. For future reference, I would use the juice of a whole lime for a slightly more tart flavour, and use real lychee juice rather than a liqueur.